This Left Hand Side High Pressure DIN Modular Manifold Valve, without blanking plug, is made by San-o-Sub, a leading Italian manufacturer of medical, industrial and scuba valves. They are strong and reliable and are made from really top quality materials. The inner air passages were carefully studied in the design so as to guarantee top performance even, and above all, with the top performance regulators. 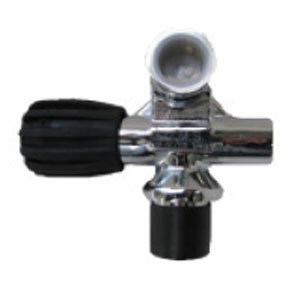 The valve design ensures an excellent grip, facilitating opening and closing of the tank. The valve is for manifolds with a torroidal connection. It comes with a standard 300 Bar DIN outlet to accommodate 300 bar DIN regulators only. This valve is typically used together with the matching 300 Bar Right Hand Side Manifold Valve, plus a San-o-Sub Manifold Centre Isolation Cross Bar, to create a complete Isolation Manifold setup for twin 300 bar cylinders. WARNING: Please ensure that you are fitting the valve to a cylinder with a matching thread. Getting it wrong is extremely dangerous. The valve is manufactured using certified CW 617 N pressed brass. The valve is precision cut using the latest CNC technologies and then protected with nickel and chrome platings, and then assembled and quality controlled with special calibration equipment by expert staff. The valves are CE EN250 and PED CE 97/23 approved and come with all necessary declarations. All the valves include seals and are assembled with compatible oxygen lubricants. If you require a blanking plug for this valve, see Valve End Plug for Rotating Crossbar Manifold Valve. Colour: Black valve knob is standard.